Black Partan Penny Formal is so Graceful that it has its own charm be it any gathering, Three Separate Layers of Premium Leather adjoined on an Italian Leather Sole is the best deal anyone can ever have in such price. Its has more to give in return than what you pay for it. Patran Penny Formal is packed with a lot of great utilities, some of the are listed below. Super Quality Cow leather Upper. Leather Pick affixed on top. Burgundy Carclus is one of the most elegant Hand-Stitched moccasins with Mesmerizing Tassels which definitely does the job, Be it a professional meeting, Social Gathering,or a casual friends night out, The Italian Leather sole has extra Grip and perfect hold around your feet. 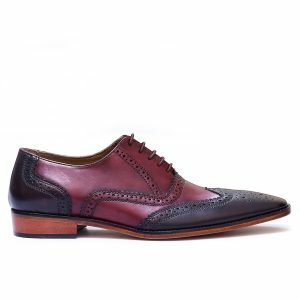 This Hand Painted Burgundy Monk is only for style-conscious gents who value monk shoes to its core, Burgundy cassafo brogue is an awesome hybrid getting color, design and style all right. The imported Rubber Sole adds value to it. Let your style take a boom with Boonie, 3 eyelets captoe in Derby look Featuring highest quality “Rubber Sole” with firm grip and charming looks. Italian men don’t share the British obsession with brown shoes and prefer to wear tan at work, rest and play. Our brown cap-toe shoes reflect our obsession with style and detail and are handcrafted from the finest leather. Brown Modecha don’t need any introduction, Ever Classic Black Brogues are Finally here, Crafted with Perfection, Hand-Made Super Cow Leather isn’t the only Special thing about it, Double Eva Padding keeps your feel warm and soft. Italian Made Real Leather Sole Completes this Brogues to be in the classics. 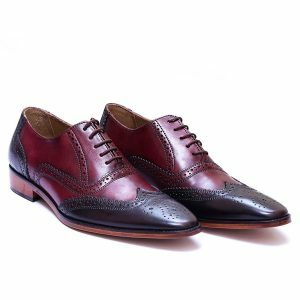 Brown Chive is for all the Shoes addicts who value horsebits Semi Formals, Specially with awesome color finish, Its upper is burnished to the best shade brown can get. It features Imported Rubber sole for strong grip and longer life. Brown Basstam is an Eye-Magnet, It’s Classy Perforated Leather makes sure you feet gets the gaze it deserves, stylish pick on top of the shoes makes it super cool, Italian Leather sole makes it a great formal wear. Arino promises royal grip on your feet. Black Graddu is beautifully made with skilled hands, The special thing about this gorgeous pair of semi-formal loafers is it’s surprisingly gentle grip. Soft Calf Skin. Upper is so attractive that it can’t just be described in words. Filda Black Bit Loafer is Awe-inspiring, Its hand-stitched flawlessly layers on layers topped with a cool Gancio, This Semi-Formal pair of beauty can inspire you to be unparalleled, It is finished with an Italian made Leather sole for your fancy. Stick to be on top of style game with Black Attessy, Classic 5 eyelet Oxfords featuring Imported Solid Rubber sole is nothing but luxury, Soft Calf perferrated leather shines bright like a treat to eyes and gift to the feet. Perfect semi-Formal lace-up to own. Thongo Tan is not less than a masterpiece, Its crowned with a tassel pair to add up beauty to this faboulous pair, Preferrated leather artistically crafted to one of the iconic pairs known. It features an imported leather sole prolonging its life. Black Modecha don’t need any introduction, Ever Classic Black Brogues are Finally here, Crafted with Perfection, Hand-Made Super Cow Leather isn’t the only Special thing about it, Double Eva Padding keeps your feet feel warm and soft. Italian Made Real Leather Sole Completes this Brogues to be in the classics.